As the Port Huron Prowlers playoff drive for a Commissioners Cup championship gets under way, let's take a look back at what has been an historic Federal Hockey League season for the Blue Water Area's only professional sports team. Looking back, it's hard to imagine what was actually coming after the Prowlers opened the season (5-5-1) through their first eleven contests. Little was it known, the team would go on a torrid run that would see them earn a point in 38 consecutive games! A stretch that would include 37 victories and winning streaks of 13 and 24 straight games, the later an FHL record (breaking the old mark of 21 set by the New York Aviators during the 2010-11 FHL season). The 38 game bindge began after a December 3rd set back and lasted until March 31st, a span of almost four months, totaling 117 days on the calendar. Perhaps even more impressive was a stretch of 20 consecutive road victories for the Prowlers, who shared their success equally between McMorran Arena (23 wins at home) and the other building around the Federal Hockey League (21 road victories). Along the way the Prowlers would set league records for most victories in a season (44) and most points (131), finishing in first place overall in the standings. An accomplishment not preformed by a professional hockey team in Port Huron since the Flags topped the IHL standings over five decades ago in 1964-65. The Prowlers team accomplishments also allowed for several personal honors for the many players who starred for the club all season long. Branden Parkhouse was named FHL Most Valuable Player, becoming the second straight Prowler to win the honor, joining Matt Robertson who was named MVP for the 2016-17 season. Parkhouse and Robertson also shared league honors with four other players, as FHL Forwards of the Year. 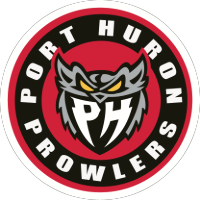 Parkhouse (31) and Robertson (36), joined Dalton Jay (37) as the three Port Huron players to eclipse the 30 goal mark this season, giving the Prowlers half of the FHL's six 30 goal scorers this year. Throw in Austin Daae (26) and Matt Graham (20) and Port Huron boasts five of the 12 players to reach the 20 goal mark in the league this season. Other award winners included Josh Colten, who shared the Defenseman of the Year honors after posting ten goals, 47 points, and a plus 34 rating in 47 games. Plus amazing rookie goaltender Michael Santaguida, who posted a (23-1-1) record, a 2.24 goals against average, and a .938 save percentage, to not suprisingly be named both FHL Goalie of the Year and Rookie of the Year. The final honor went to head coach Joe Pace Sr., who was named FHL Coach of the Year. Since taking over the hockey team on January 7, 2017, the Prowlers have been an astounding (61-18-6) over an 85 game stretch. As the post season begins the Prowlers join both Danville and Watertown in the quest to do something else that has never been done by a Federal Hockey League franchise, win a second championship. In seven years the league has had seven different Cup winners, including Port Huron in 2015-16. One more goal for the Prowlers to grab at, in a season of incredible records, streaks, and accomplishments! It would the cap to a truely historic season.